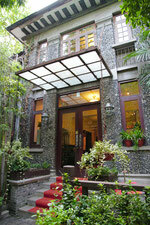 About hanyuan chinese school in shanghai - learn chinese in shanghai hanyuan mandarin school! The first reason for you to choose HanYuan to be your mandarin school is we have all the kinds of courses to meet your requests. You are the leading role, so you will make big progress in your mandarin. Every student has different study content, target and method. Some students prefer to make progress step by step when they enjoy the classes very well, and some students prefer to achieve their targets in a very short time. We will make the best suitable study plans for every student. You will try your best to study more and more with the encouragements from your classmates. There will be 2-4 students who have the similar mandarin level in one group lesson. You will find that is a big fun to get the encouragements from your classmates and you will make interesting conversations in mandarin with them. Please don't doubt that if you sit in your home to learn mandarin someday by our online course. We will sincerely provide you the online course if the students have difficulty to come to the school to learn mandarin. We think the most important thing for the company training course is to help students to control learning efficiency and master conversation ability. We have confidence to help the students to remember vocabulary and master the conversation ability in limited budget and validation period. We will discuss the study requests and targets with the company in detail. And we will make the study plan as soon as possible. The second reason for you to choose HanYuan to be your mandarin school is we have the best comfortable environment. "I would like to come to school to study", " I would like to continue my mandarin course"," energetic"
We know the study environment, comfort and convenience is very important when the students take the mandarin course. So we have the one to one classrooms and group lessons classrooms. The third reason for you to choose HanYuan to be your mandarin school is we have the effective study materials and methods. We have a whole set of effective study methods for our students. Our method will help students to learn mandarin the sooner the better. Students will study mandarin very well by our clear grammar explanation, basic exercise and different practice. The fourth reason for you to choose HanYuan to be your mandarin school is we have the excellent tutor team. It will be more helpful for you to learn mandarin if you have the good teacher to give you advice and suggestion besides the student personal ablity. Only HanYuan has the system! Every student in our school will have a teacher who will in charge of the whole package of the Chinese course. The teacher will send regular study report to student once a month. And the teacher will also sincerely give the opinions to students that is about to renew the study plans and methods, students also can join the Chinese level test regularly. The sixth reason for you to choose HanYuan to be your mandarin school is our teachers will guide you to let you pass the HSK examination. We set up specifically for the examination guidance teaching team，and help students pass HSK examination by our special materials. Our students have achieved very high exam pass rate.